This is a rather old creation, made during the summer of last year, but it is still quite interesting nonetheless. I have always had a fascination with duct tape (I even founded a duct tape club at my old high school), and have earned the title “The Duct Tape Guy,” here at Virginia Tech. I wanted to do something electronic with duct tape, but seeing as how duct tape is an insulator, electricity was a no-go. So I decided to go the data route. Overall though, the way I did this was rather difficult. 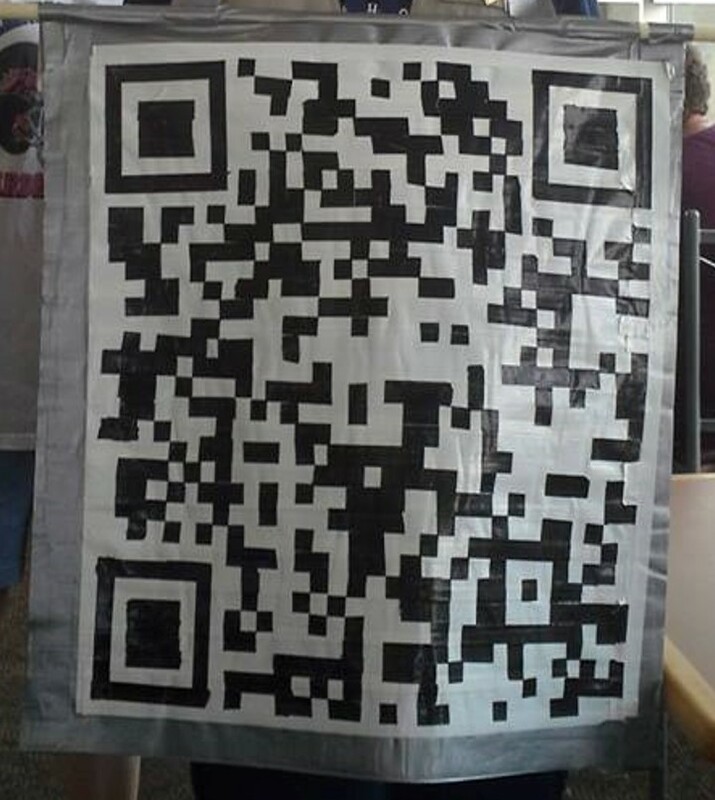 After setting up a site in the directory of one of my other inactive sites (https://sites.google.com/a/vt.edu/duct-tape-club-basecamp/our-company), I got the QR code for it fromwww.qrstuff.com, then proceeded to copy the black squares onto a sheet of white duct tape with black duct tape. 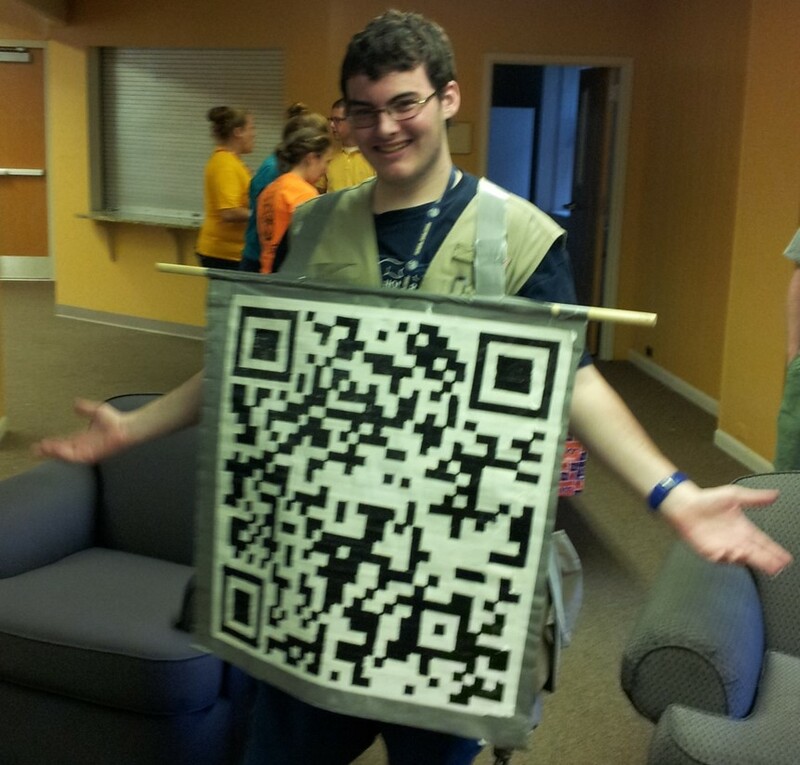 While this took an extremely long time, I ended up with a fully duct tape QR code. During testing, the readability was not as high as I would have liked. Initially, the readability was around 45% for android and 30% for iPhone. I then did a little bit of research on QR codes, and decided that it was better to change up the error correction codes (the bits directly under the top left square and directly to the right of the bottom left square), in order to make the reader “guess” more of the code. After that subtle change, the readability jumped to about 70% for iPhones and 85% for android. After cleaning up some of the lines, almost everyone can successfully scan it. I’m not entirely sure what to do with it, but I think it is quite interesting. 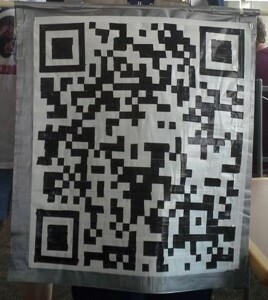 It is a giant duct tape QR code. What’s not to like? 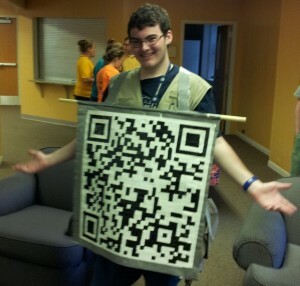 Random people will come up and ask to scan me. It may be a weird way to start a conversation, but it is definitely a way to meet new people. It is not completely readable. Building this was a painstaking job. When reading it, glare off the shiny duct tape is an issue. I don’t really use it for anything other than a Halloween costume (I have it link to an impossible test; I know what scares the college students).